Kinshofer introduced the HPXdrive system, a new generation of grab technology. The patented technology features two shafts, which run opposed and have a helix thread. It’s hydraulically driven by a single piston. This design gives the HPXdrive a longer life cycle and allows it to deliver full and constant closing force throughout the entire open and close cycle, according to the company. The system provides a solution for various applications including construction, loading and unloading, recycling, raw material extraction, maintenance and refurbishment. 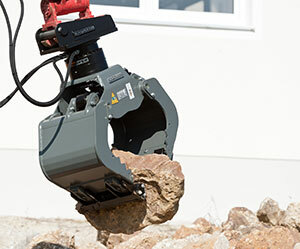 The HPXdrive system is compatible with Kinshofer’s multipurpose grapple, demolition and sorting grapple, clamshell bucket, timber or rock grapple, NOX-Tiltrotator and for special attachments, such as the forceps grapple. The compact unit features a low overall height and a fully enclosed system with no protruding parts. It’s resistant to dirt, blows and uprising material, and the internal oil feed-through eliminates external hose connections, protecting the drive unit against leaks or hose ruptures. Additionally, the waterproof design features no greasing points or short hoses, with no loss of oil for contaminate-free working. Operators will experience improved gripping capabilities and precise positioning due to the high constant closing force. All moving parts in the HPXdrive continually run through a self-lubrication oil bath. Operators using one drive unit can change from one application to another within minutes, and the new integrated shell exchange system makes replacing shells fast and easy, Kinshofer said.